The Cardinal Health Duraprene™ synthetic surgical glove is produced with a neoprene synthetic formulation that fits, feels and performs like natural rubber latex. This advanced glove ensures strong confident barrier protection while offering outstanding comfort and tactile sensitivity. Lightly powdered for ease of donning and with our patented natural anatomical design, this glove provides comfort and helps reduce hand fatigue in even the longest procedures. 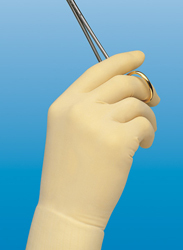 Duraprene™ — get protection, performance and peace of mind from one synthetic surgical glove. Protection, Performance and Peace of Mind.